Though there isn't much Dolby Vision content currently available, the LG Super UHD 65UH950T stands at the forefront of the HDR revolution. 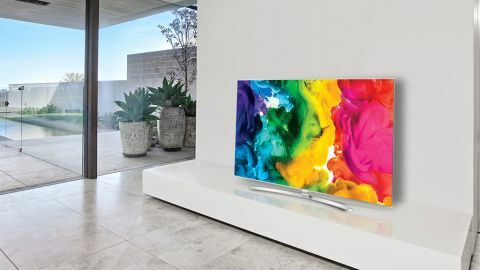 Though LG's 4K OLED televisions are probably the best that money can buy at the moment, they also belong to a cost-prohibitive price bracket that many people simply can't afford. This is why it makes sense for the South Korean manufacturer to also provide some more affordable, non-OLED alternatives. With high dynamic-range (HDR) advancing as the next evolution in television technology, LG has taken things a step further with an impressive 4K set that supports standard HDR10 content, as well as the technically superior Dolby Vision format. Add to this LG's signature ColourPrime technology (in direct competition with Sony's Triluminos and Samsung's Active Crystal Color), and the UH950T is able to provide exceptionally vibrant picture quality, whatever the content source. LG's 65-inch UH950T is available now for $5,999 – significantly less expensive than anything in LG's 4K OLED range. Alternatively, you can pick up the smaller (but identically specced-out) 55-inch version for $3,999. Though it's unable to boast the infinite contrast ratios of LG's own OLED range, the UH950T's edge-lit, quantum-dot display still has the capacity to wow viewers. Its 12-bit colour depth and Dolby Vision support gives the LCD panel the ability to display a staggering 68 billion colours – quite a leap compared to HDR10's 10-bit depth and one billion colour capacity. The UH950T is an exceptional-looking television, with a flat, almost borderless design. Along with its classy silver finish and minimalist approach, this is a set that stands above everything else on the market in the looks department. It's also remarkably thin, with a thickness of only 55mm (aside from its lower middle section, which holds the bulk of its internals). Its slimness and stylish appearance makes LG's Super UHD set a prime candidate for 'best television to wall mount'. Admittedly, the UH950T's curved stand leaves a lot to be desired, looking like it actually belongs to one of LG's curved TV sets. Though the stand curves forward quite a bit, it does prove to be a decent place to rest a soundbar, such as LG's own SH7, which was used during our review period. Not everyone has (or wants) a soundbar, though, so it's a good thing that LG's partnership with Harman Kardon continues to bear fruit, with the UH950T once again sporting the Ultra Surround Sound module seen in LG's EG960T OLED television, which pumps out sound from a 4-speaker stereo setup that offers 40W of output power. Connections include three HDMI 2.0a ports and three USB ports on the side of the television, and on the back you'll find the usual composite/component inputs, as well as a port for optical digital audio output. The UH950T can connect to the internet via its Ethernet port, or using the set's built-in Wi-Fi, which supports 802.11 a/b/g/n/ac. 3D capability is also available, with LG ditching Active Shutter technology in favour of its new Cinema 3D FPR technology, which places a thin layer over the screen that provides a similar experience to Active 3D using regular passive glasses.